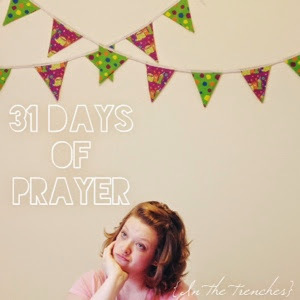 Day two of 31 Days of Prayer, and I'm going to jump right in and get honest. "Oh dear Jesus please don't let me lose my ever lovin mind!!!" "Oh Praise the Lord that parking spot next to the cart corral is open!!" "God in Heaven give me strength or someone is going to end up on permanent timeout. For. Ev. Er." I hate to admit it but a lot of my "prayers" sound like this. I'm not saying I don't ever pray in a more intentional way, I'm just saying the majority of my prayers through the day are less intentional, less about God, less about my relationship with Him, and more like observations...okay they're more like complaints thinly veiled as prayers. They are a stream of moment based blips that are born in my selfishness, my impatience and my lack of grace. In the legal system they call this kind of outburst an excited utterance. In court an excited utterance is an exception to the hearsay rule. This means that a statement about an event made while the person is still under the stress of that event is permissible as evidence in court in a way that thoughts and statements about an event made after the fact are not. You still with me? The thought process is that an outburst made in the heat of the moment will be trustworthy because the person hasn't had time to reflect on, analyze or fabricate anything. The Bible says something similar in Luke, "from the abundance of the heart the mouth speaks" (6.45b). In my excited utterance prayers, before I've had the chance to reflect and analyze what I want to say to God, I speak from the abundance of my heart, and my "prayers" show a selfish, impatient heart without grace. If I want to change my prayer life I need to ask myself this: if the majority of my prayer life is in the moment prayers, and the majority of those prayers are not growing me spiritually or glorifying the Lord, then what is their purpose? And how can I develop "excited utterance" prayers that DO grow me and glorify the Lord? How do I change my heart? Ready for some good news? I can't change my heart. And the Lord never asked me to. What He asks is that I open the door and give Him the opportunity to change my heart. The moment that excited utterance prayer is out there for me to see and reflect on I can make a choice, let it stand or take the opportunity to utter another, more intentional prayer, one that invites the Lord to redirect my thoughts and to teach me patience, selflessness and humility. I have the opportunity to open the door and let Him change my heart. So that is my challenge to myself starting today, and my challenge to you (whoever you are) too. Let's make the first step in developing a vibrant prayer life be to let the Lord direct our hearts.